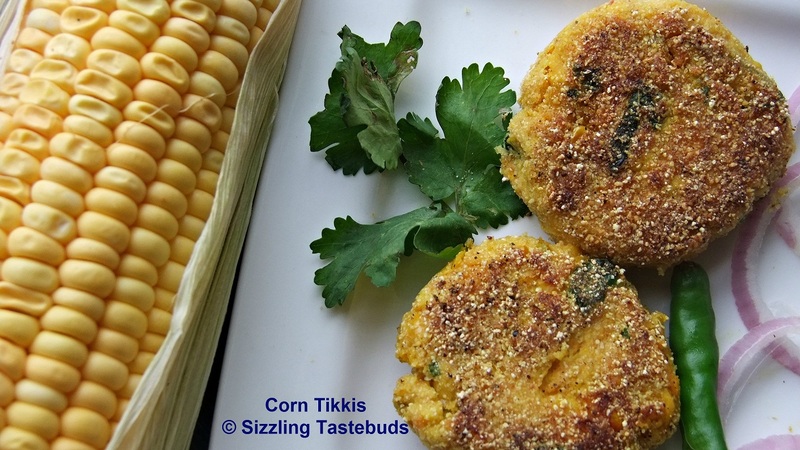 Nothing can beat this yummilicious Makai Tikki or Corn Tikki. This is different from the Makai Aloo Tikki I had made earlier. 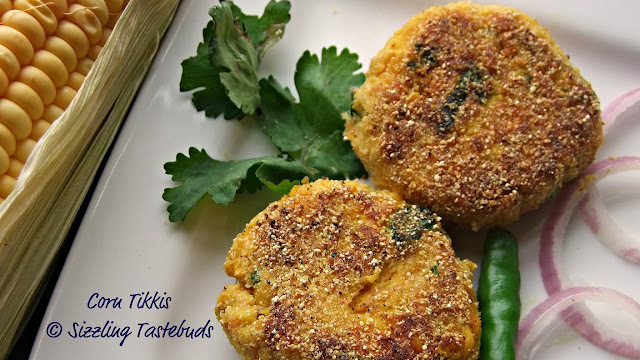 As a mom of a young girl, I feel Tikkis are the best way to sneak in veggies along with adding fibre (which this recipe abounds with). So evening snacks are generally cutlets or tikkis which are either baked or shallow fried. My favourites would have to be Oats Moong Tikki & Matar ki Tikki. As this is one way to beat the fat out of fast food, this is also linked to my event "Fast Food not Fat Food" that am guesthosting this month. Corn is perhaps the most under rated ingredient for weight watchers. Its more popular avatar is of course the popcorn made from dried and popped corn Kernels, which is a favourite amongst kids and adults alike! Corn is part of the Maize family which is the highest grown crop in the US. Wikipedia tells me "Maize and cornmeal (ground dried maize) constitute a staple food in many regions of the world. Introduced into Africa by the Portuguese in the 16th century, maize has become Africa's most important staple food crop Maize meal is made into a thick porridge in many cultures: from the polenta of Italy, the angu of Brazil, the mămăligă of Romania, to cornmeal mush in the U.S. (and hominy grits in the South) or the food called mealie pap in South Africa and sadza, nshima and ugali in other parts of Africa. Maize meal is also used as a replacement for wheat flour, to make cornbread and other baked products. Masa (cornmeal treated with lime water) is the main ingredient for tortillas, atole and many other dishes of Mexican food." 1) Pressure cook whole corn (on the cob) for 2 whistles along with the carrots (in a separate container). If using frozen corn, thaw and boil in slightly salted water for 10 mins till they turn soft but not mushy. Either way, drain the water and cool to room temperature. 2) If using corn cobs, use a sharp knife to deseed them from the cob. You should be left with approximately 1.5 cups of corn. 3) In a spice grinder (or a smaller mixer jar), pulse the corn along with the cooked carrots (you can also grate them instead of cooking) slightly till the kernels are slightly mashed up. 4) In a large bowl, transfer the corn kernels, add 2/3 of the bread crumbs and rest of the ingredients one by one (except oil). Do not add any water unless absolutely necessary. 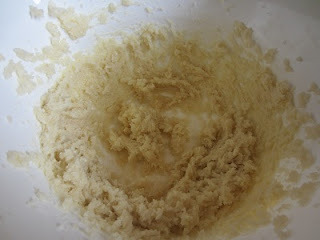 5) Shape into a nice thickish dough. Divide them into equal portions and flatten them slightly. 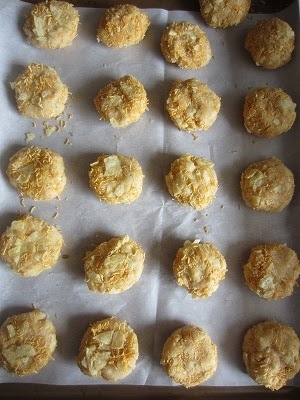 8) Coat the tikkis in some more bread crumbs (or roasted suji / yellow cornmeal) all around till the tikkis are coated. 9) Gently place the tikkis in the oil. 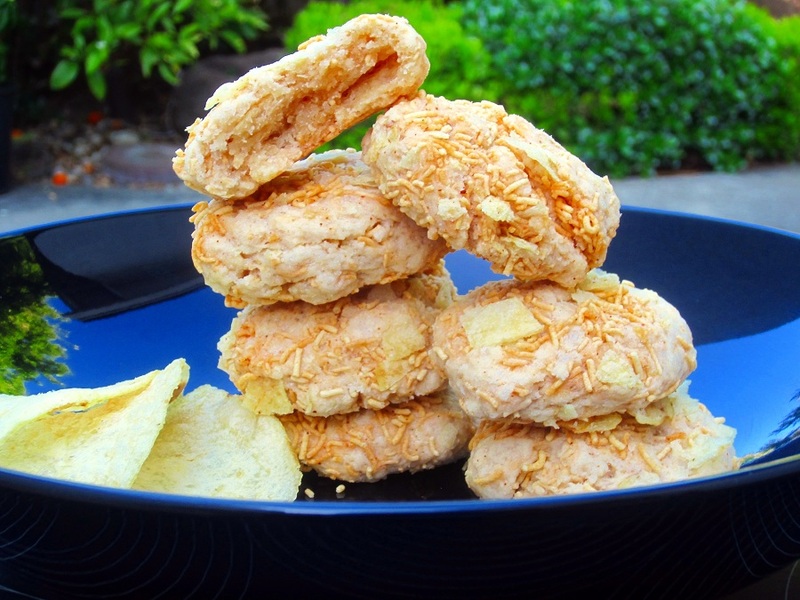 Shallow fry them (in small batches) for 2 – 3 mins on both sides till they are golden brown in colour. Come summer, and we are all looking for a zillion ways to beat the heat right ? Think smoothies / raithas / mocktails – just about anything that would take just very little time to make and then make a dash to the pool !! 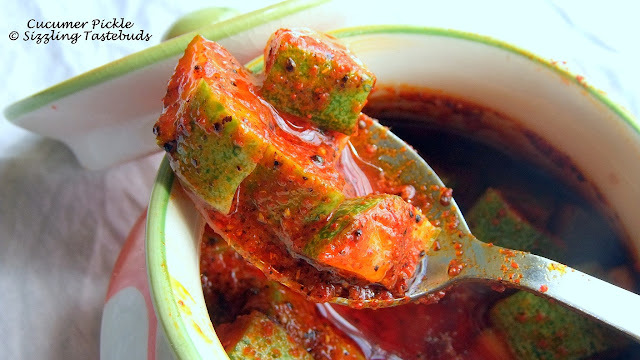 Its tantalizingly good, and although am not a great fan of pickles, this version surely will feature regularly on my dining table – summer months or not ! 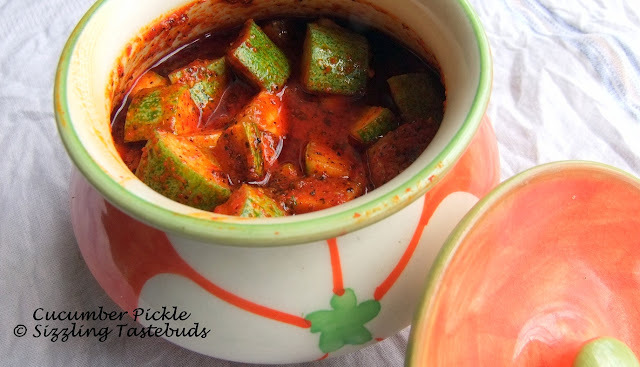 I usually make Pachadi or Raitha or even Dal with Cucumbers, but making this lipsmacking pickle was a new culinary high for me ! 1) Wash and pat dry the cucumbers. Deseed them and cube them. Lay the pieces on a plate lined with absorbent tissues. 2) Pat them dry with another paper towel. 3) For the pickle masala: Dry roast methi (fenugreek seeds) and mustard seeds separately. Powder them in a stone mortar (or briefly pulse them in a spice grinder). The former method of using a stone and pestle is preferred as heat from the mixer grinder doesn’t bear well with any pickle. Also dry roast the red chilli powder, turmeric and asafoetida separately and transfer to a plate. 4) Sterilise a glass jar (or a ceramic container). Dry thoroughly with a soft clean muslin cloth. 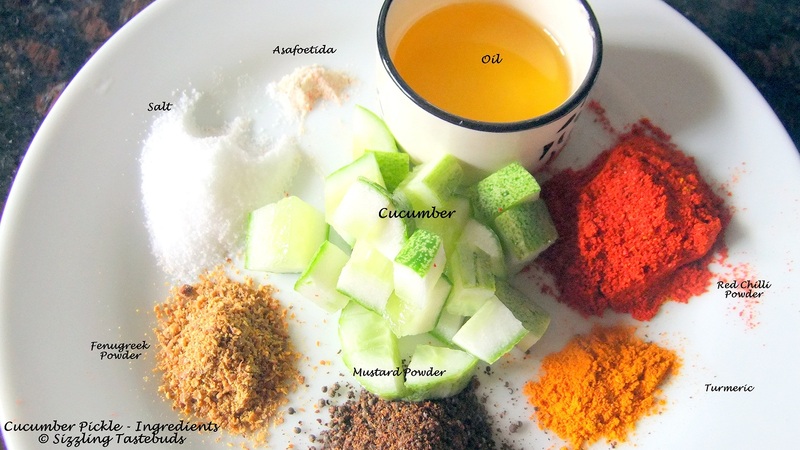 5) In a large clean glass bowl, add the cucumbers, the ingredients of the pickle masala (powdered mustard, powdered fenugreek, asafoetida , red chilli powder and turmeric powder) and give it a nice stir. 6) Now add the salt, lemon juice and oil and with a clean dry wooden spoon, mix the pickle well. 8) Stir once more and transfer to the sterilised container. 9) Refrigerate and use as required. I made a slightly large quantity, so it lasted for almost a month. 2) In a kadai, heat 1 tsp oil. Saute chopped onions and diced bell pepper. 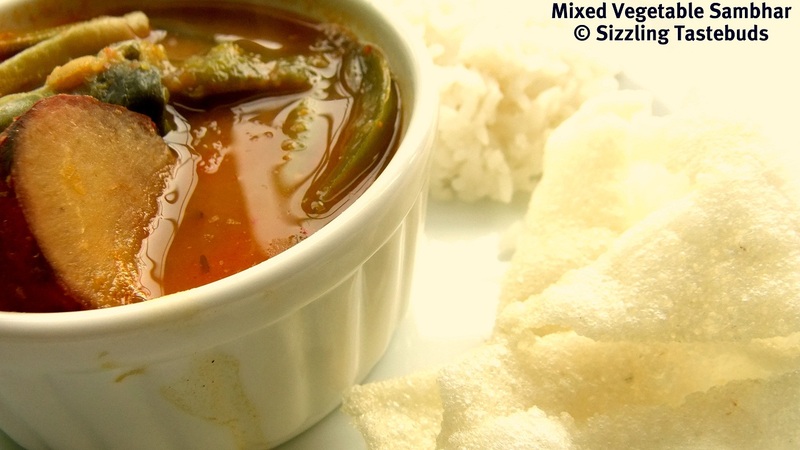 Add asafoetida and pressure cooked vegetables, cooked dal, Sambhar powder, tamarind extract (or pulp) & salt. Mix well. Add 1 - 2 cups of water to this and simmer on medium-high covered for 8-10 mins. 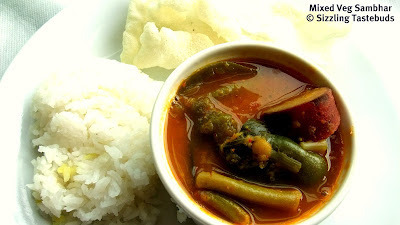 Season with mustard and curry leaves and serve hot with plain rice and papad or with yummy cool Curd rice. Dry roast all the ingredients (except coconut) in a dry pan. Grind with a little water and coconut to a smooth paste. Use in place of the Sambhar Powder. Saute the paste thoroughly till the raw smell disappears and then add the veggies and cooked dal. 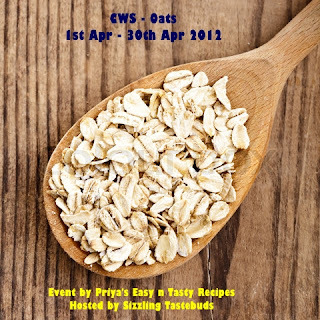 It was wonderful to receive a deluge of healthy entries using Oats for my event CWS - Oats that was hosted at this space in April 2012. Thanks to Priya for this opportunity and thank you dear friends for sending over your delicious entries. The round up is presented here... enjoy !! There is no more lovely, friendly and charming relationship, communion or company than a good marriage – Martin Luther. Martin Luther definitely got the essence of any good marriage right in those words above. What better defines a wedding than a companionship, isn’t it ? A life long commitment, a whole heart for a whole life (as I read somewhere), two souls coming together in holy matrimony ! A wonderful feeling to last a lifetime J But, hey hold your horses. In case you think I have switched careers (or hobby if you prefer) from cooking food to cooking up stories on matrimony, its not so. We at Blogging Marathon celebrate a virtual wedding shower for our dear friend Aarthi who is to be wedded later this fortnight ! And what better way than to pick and choose a dish from her blog, and recreate it as a celebration J Aarthi, this is for you dear – and wishing you every happiness in the days ahead J I was literally stumped when I had to choose from a wide array of dishes that Aarthi has managed to churn out – its like a huge menu card with its array of dishes from several cuisines. I finally managed to pick out Malai Kofta from her blog, and started to make the same. As luck would have it, the omnipresent ingredient in my freezer – Paneer – ran out. Perhaps, to make way for these delicious Low fat bottlegourd Koftas that turned out yummy ! And there was no telling how wonderful they tasted with hot Phulkas right out of the stove . 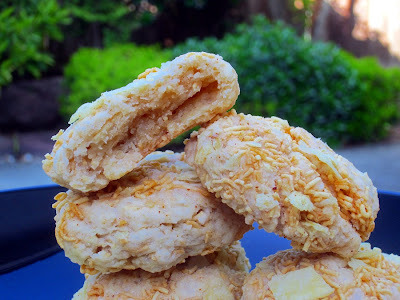 I pretty much followed her recipe, making tweaks here and there for a low fat version ! Which also qualifies this dish to go straight to the event that I am hosting all May – Fast Food not Fat Food and also to Ramya's ABC Series-Gourds..
1) Wash and peel bottlegourd. Grate finely. Leave for few mins. Taking handfuls of the vegetable, squeeze out the water tightly. Again leave for 3-4 mins. Squeeze again. Repeat for the third time. 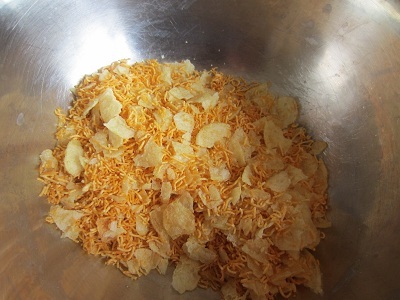 The grated vegetable should be almost dry to the touch. 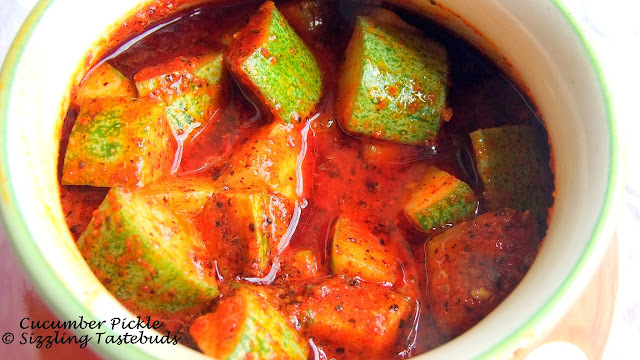 2) In a large bowl, mix the grated bottle gourd. Add chickpea flour (besan), salt, half of the dry masala powders (red chilly / pepper/ garam masala / coriander powder / cumin powder, turmeric, amchur), coriander leaves and mix into thickish dough. 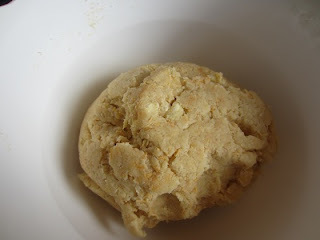 Do not add any water (unless you use ½ tsp or less for binding – the salt will provide enough moisture). 3) Make equal portions of this dough and keep covered for 2 -3 mins. 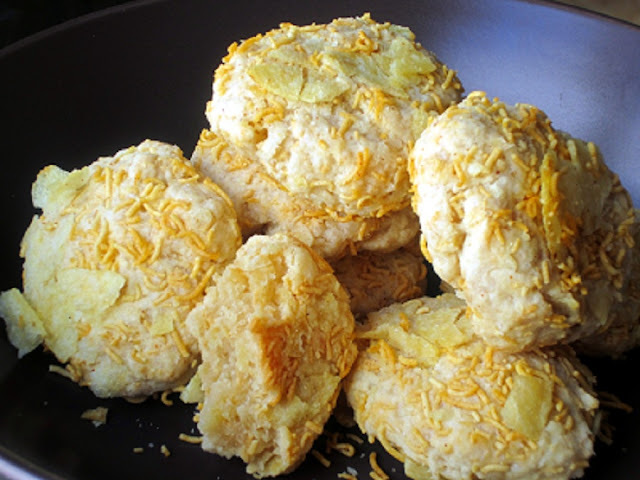 4) Heat a paniyaram pan (you can also deep fry the balls, but I didn’t). Line the pan with a film of oil. 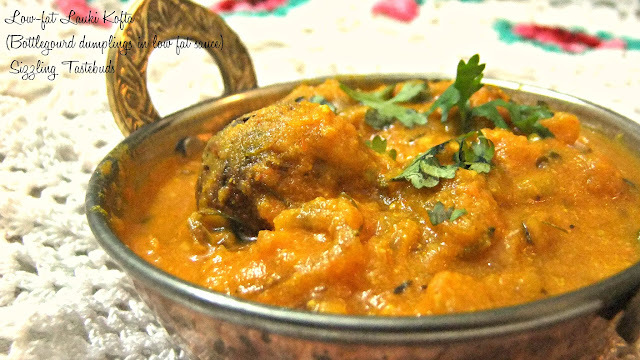 Place the bottle gourd balls and fry them on medium-high flame for 4 – 6 mins till they turn golden brown on all sides. Drizzle a little more oil to help them cook faster. 5) Drain all the koftas made this way on a paper towel. 1) In a pan, heat 2 TBSP of oil. Saute chopped garlic, ginger, chopped onions and tomatoes for 3 – 5 mins. Cool and dry them with the rest of the masala spice paste (indicated above). 2) In the same pan, heat the rest of the oil. Splutter cumin. When done, add the rest of the chopped onions and sauté lightly. Now add the ground masala and cook for 3 -4 mins. Add the rest of the dry masala powders, salt, turmeric and fry again for 7 -8 mins till the oil separates. 3) You may add a cup or two of water to get a fairly large amount of thickish gravy. While the gravy simmers, gently add in the koftas and Cook covered for 3 mins till the koftas absorb some of the flavours of the gravy. To make this a richer dish, finish with cream just before you take it off the fire. Transfer to serving dish. Finish with lemon juice and coriander leaves. Serve hot with Rotis / Naan / Phulkas. You may also place two koftas per serving and pour the gravy onto them just before serving. Really glad to note we have completed four successful editions of the monthly challenge - Magic Mingle. Thank you members for your support. We enter May 2012 with the challenge ingredients here ! So, are you ready for the challenge ? If you are keen to see what our members have dished in the previous 4 editions, check the following links. 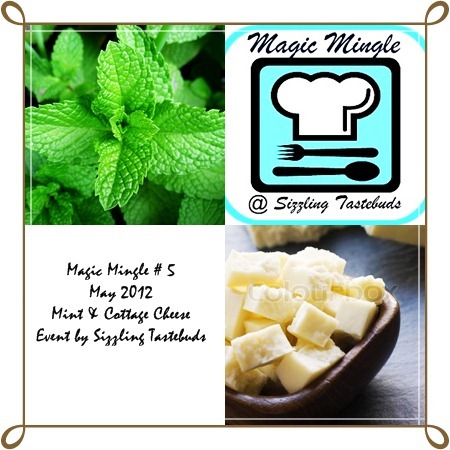 6) Once you post & link your entry (using the linky tool at the end of this post) between 5th & 15th of the month,mail the entry URL to the google groups email ID - magicmingle@googlegroups.com with the subject line "MM-May 2012". · Paneer (Cottage Cheese) can be low fat or full fat. Store bought or home made versions can be used. However, Tofu is not allowed. · Please remember these two ingredients must feature as one of the main ingredients for the SAME DISH and not as garnish. Hope you are excited and would link your entries soon.